UC is harnessing its resources to address one of the critical issues of our time: How to sustainably and nutritiously feed a world population expected to reach eight billion by 2025. The quest to establish global food security and address related challenges of nutrition and sustainability has never been so important. A billion people — most of them in the developing world — suffer from chronic hunger or serious nutritional deficiencies. More than half a billion — primarily in industrialized nations — are obese. Against this backdrop, climate change and population growth fuel additional uncertainty and urgency. 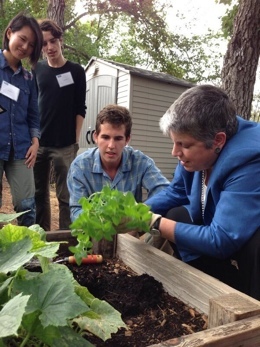 Recognizing that UC is uniquely positioned to play a leading role in addressing the related challenges of nutrition and sustainability, President Janet Napolitano, together with UC’s 10 chancellors, launched the UC Global Food Initiative. The initiative will align the university’s research, outreach and operations in a sustained effort to develop, demonstrate and export solutions — throughout California, the U.S. and the world — for food security, health and sustainability. President Napolitano and chancellors from all 10 campuses are united in this goal. The initiative draws on UC’s leadership in agriculture, medicine, nutrition, climate science, public policy, social science, biological science, humanities, arts and law, among others. Its focus is both external, such as how UC translates research into policy and helps communities eat more sustainably, and internal, such as how UC leverages its collective buying power and dining practices to create desirable policies and outcomes. The UC Global Food Initiative involves all 10 UC campuses, UC’s Division of Agriculture and Natural Resources, and Lawrence Berkeley National Laboratory, with guidance from a systemwide working group appointed by President Napolitano and the chancellors. Campuses will assume leadership roles for the system in pursuing one or more components of the initiative, drawing on the efforts of faculty, students and staff, as well as engagement with the community. These components will encompass matters related to campus operations, curriculum and research, and outreach and policy. To support these efforts, the Office of the President is creating a student fellowship program, which will fund three undergraduate or graduate students on each campus to work on research projects or internships related to the initiative. Deploying UC’s research to shape, impact and drive policy discussions around food issues at the local, statewide, national and international levels. Reforming vending machines practices to enhance the availability of healthy choices. Public commitment: As the premier public research university in the world, UC is deeply engaged in the knowledge export business – rooted in California, but with global reach – a passion shared by students and faculty. UC’s campuses also set examples as living laboratories for sustainable operations. Multidisciplinary expertise: UC is California’s land-grant university and has played a key part in helping California become the nation’s leading agricultural state. Its campuses, agricultural division and labs are equipped to tackle the food challenge across multiple disciplines. Trusted convener: Building on its intellectual and technical firepower, UC seeks to find common ground to help communities in California and around the world find their way to a sustainable food future. UC’s Division of Agriculture and Natural Resources works with more than 130 countries from Afghanistan to Zimbabwe to conduct research and provide expert agricultural advice. The UC Global Food Initiative will build on these efforts and expand them locally, nationally and internationally. Learn more about how UC campuses and ANR are contributing to the global food conversation. For media inquiries, call (510) 987-9200. Comments or feedback? Please email us.